EIE Tip of the Day 28: Eat Pemmican. If you don’t know about this super food, here you go. You can literally live on this stuff! Notes: Focus on positioning and technique over weight! 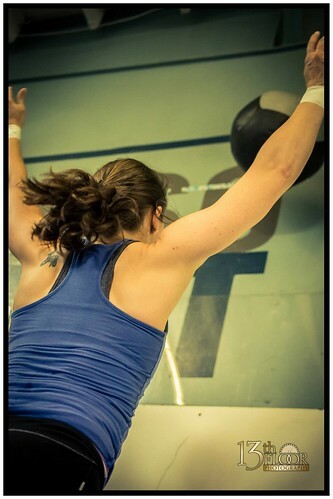 Notes: The sequence is 1 First Pull with a 3 second pause at the knees, then a full Clean & Jerk. Do not release tension on the BB when returning to the floor after the Pause First Pull. Be sure to check out all of Dino’s awesome pics of Friday Night Lights here: 13.1, 13.2, 13.3. Two more to go!! Could you post the reasoning behind having different coaches program the weekly workouts… if they have the same “template”, goals, progressions, philosophy, cycles? It does not seem like they do. I understand there is the component of “constantly varied’ but I would like an explanation of why having different coaches program week-to-week is beneficial on the whole. I would think if the same person was programming, there would be more considerations as to what was done in prior weeks and months and therefore have more continuity in the training. The question above was posted in our Suggestion Box over a month ago and I have been looking forward to responding. The programming and implementation of workouts is at the heart of what differentiates one CrossFit gym from another. As gym owners, we are presented with the unique problem of having to program for both varying athletic abilities and fitness goals. There are athletes that have been CrossFitting for one month in the same class as a 7 year veteran. We are striving to provide an environment that allows any athlete to thrive. Like all aspects of our gym, this has been a constantly evolving process based on your feedback, our observations and growth. Without going into too much detail, here is how it has evolved and how the process currently works. 1. For the first year and a half we were open, we went off the mainsite programming ON THE DAY! What this means is that both coaches and athletes waited each day until 5pm to see what was released for the following day. Looking back, this was a crazy and exciting time. If you don’t know anything about mainsite, they post their workouts on a 3 days in a row of work, 1 day off protocol. This ensured to our members that we were never programming for ease of implementation or programming. We were embracing the CrossFit motto of being prepared for the unknown and unknowable and believed their programming to be more challenging and fun than any gym we had ever seen. As a community, we learned to deal with whatever workout they threw at us. That sometimes meant 3 barbells per person per workout, running with barbells down the street, workouts that lasted well over an hour and lots of muscle ups! As much fun as this was, we began to run into a few problems over time. 2. One problem was that we had to program for the rest days because we were open 7 days a week, but we didn’t know what the mainsite would program for the following day. Our solution was to discontinue the on the day approach and start following on a two week delay. This allowed us to plan the rest days better as well as to prepare ourselves and the members for the crazier workouts. 3. The next problem we had to address was that the mainsite program was a 6 day a week program (3 days on/1 day off/3 days on), with the 3 days designed to work together. Since many people could not stick to this program, the programming ended up being segmented. While CrossFit in even the most diluted fashion will offer gains, we began to hear two things from our more veteran athletes: I want to get stronger and better at the Olympic Lifts. We kept the programming the same and worked to introduce basic strength programs into the group class when the workout time would allow, as well as educated and advised people on how to implement supplemental training to the program. For strength, the primary CrossFit tool was the 5/3/1 program and for Olympic Lifting we had people working off of Mike’s Gyms programming. People would perform these protocols during Open Gym times, on the side during regular class and wherever they could squeeze them in. This was less than ideal and we knew a larger change was needed. 4. During this time, we managed to qualify our team to the 2012 CrossFit Games Regionals! We knew that we would not place in the top 3 spots to qualify for the finals, but we trained hard and did our best. In the aftermath, we recognized two things, we needed to get stronger and better at the Olympic lifts, duh! Ok, we already knew that, and we found the answer by looking at the top athletes and teams succeeding in the Games. This was how we first found the Outlaw Way. 5. The Outlaw Way is what we currently use as our training template and is programmed by a man named Rudy Nielsen. When I first read his Outlaw Doctrine I knew this was what we had been looking for. I sat down with the coaches and we decided to dive right in and experiment with this ourselves first. Immediately we recognized that the stimulus was very different, very demanding, more time consuming, technical and effective for developing an athlete! After about a month, we made the big decision to switch from our Mainsite ways and introduce the new Outlaw Way to the group classes. From our past experience with mainsite, we decided to operate on a two week delay from the Outlaw website and over time learn how to program ourselves. This is where your question finally gets answered from above! 6. If you go to the Outlaw Way website or you have ever noticed the competitive athletes and coaches training, it does not look exactly like what you do in class. We use their programming as a general guideline for what you do in regular class, but have to scale down the volume. In the beginning, we followed the program very closely, and quickly realized that while this programming was very effective, it was also very repetitive. Additionally, there is no way we can translate this program over to every athlete that attends the gym. Over the past 8 months, we have rotated the coach each week that will review the correlated Outlaw programming and they have the ability to pick and choose which aspects of the daily programming will make it into the regular group class and it is reviewed by me before being posted to the website. The priority has been to focus on developing both the strength and conditioning aspects equally. The strength portions are to consist primarily of squatting and olympic lifting with at least 2 days of gymnastic strength elements added in. The conditioning will be based on the outlaw conditioning workouts and average 15 minutes or less to keep intensity high. The OW programming is designed to workout on MTuWFSa and rest on ThSu, which again leaves us in the position of having to create two additional days of workouts. These days consist of using some of the movements that can’t fit into a single day of programming from the regular programming, and additionally, we still pull from mainsite fairly often, play with other crossfit programs like CF Football or Endurance, test traditional baseline workouts, etc. The structure of Strength and Conditioning maintains and the conditioning maintains, but each coach that programs for the week is allowed their own slight flair with the above criteria. The evolution continues. In the next segment, I will discuss how we came to develop the classic and advanced versions, as well as the the differences between the two. Also, this week will be the introduction of more gymnastics and kettlebells into the group class program! Be sure to comment below if you have any additional questions!